Louisa married John Quincy Adams on July 26, 1797, despite the disapproval of the groom's mother. After the wedding the couple went to Berlin, where Adams was serving as Minister to Prussia. At the Prussian court Louisa displayed the style and grace of a diplomat's lady. After several miscarriages, in 1801 Louisa Adams bore her first child, George Washington Adams. Louisa's first time in America came in 1801 when John Quincy was called back from diplomatic service by President Thomas Jefferson. She finally met her in-laws, former president John Adams and the formidable Abigail Adams, at that time. John Quincy practiced law and in 1803 he was elected a U.S. Senator. Two more sons were born in Washington, DC. Despite the glamour of the tsar's court, Louisa struggled with cold winters, strange customs, limited funds and poor health; an infant daughter born in 1811 died the next year. Louisa took up writing to keep her mind from her grief. In all, Louisa Adams was pregnant fourteen times, miscarried nine times and one child was stillborn. In 1814, John Quincy was summoned to The Hague to participate in peace talks to end the War of 1812. While alone in Russia, Louisa managed the family's affairs. In 1815, Louisa and little Charles had to make a a risky 40-day journey across war-torn Europe to join her husband in Paris. Louisa's courage and language skills helped the two of them find safe passage through unfamiliar and often dangerous lands. Happily, the next two years gave her an interlude of family life in England with their three sons. The appointment of John Quincy as Secretary of State by President James Monroe brought the Adamses to Washington, DC, in 1817, and Louisa's drawing room became a center for the diplomatic corps and other notables. Good music enhanced her Tuesday evenings at home, and theater parties contributed to her reputation as an outstanding hostess. Louisa Adams impressed congressmen and government figures with her political acumen, and made frequent social calls on their wives and entertained Washington society at elaborate dinners and open-house receptions. These events took on greater importance because of Elizabeth Monroe's aloofness and her limited social calendar. As the wife of the secretary of state, Louisa emerged as one of the leading ladies of Washington society, using her social power to advance her husband's political interests. She helped dispel his occasional doubts about his future in politics, reminding him that public service was his destiny. She lobbied congressmen and journalists for their support in advancing Adams' presidential aspirations. In 1824, Louisa held a lavish ball celebrating the anniversary of General Andrew Jackson's victory at the Battle of New Orleans. One thousand people attended what was then called the event of the season. While she threw the ball to impress the cream of Washington society, she also used it to solicit support for her husband's presidential bid. Adams' victory in the 1824 presidential election can be attributed, at least in part, to the efforts of his wife. Given the importance of Louisa's social accomplishments and her political value to her husband, it seems as though a formidable Adams partnership was in the making. But once John Quincy won the close election, his need for his wife's advice came to an end. I am decried an incumberance unless I am required for any special purpose for a show or some political maneuver and if I wish for a trifle of any kind, any favor is required at my hands, a deaf ear is turned to my request. While Louisa Adams had embraced the role of "campaign manager," she resented her role as the President's wife and called her new home at the White House "a prison." She suffered from severe depression and became increasingly despondent during her years as First Lady. Her many pregnancies and miscarriages left her in poor health and now caused her serious discomfort in menopause. As a result, the once affable and gregarious Louisa became somewhat of a recluse. She minimized her duties in her husband's administration just as he had minimized her importance in his life. Although interested in women's rights, abolition, and later, the welfare of Native Americans, she had little impact on how future First Ladies managed their affairs. 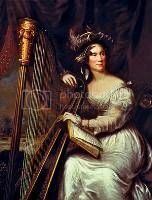 Though she continued her weekly "drawing rooms," Louisa preferred quiet evenings - reading, writing and playing her harp. She also spent a good deal of her time writing poetry and satirical plays which parodied her husband's rigidity and her own spoiled upbringing. She also began her autobiography; its title, Adventures of a Nobody, reflects her sense of self during her tenure in the White House. Through her writing and out of her own experience, Louisa began to consider the challenges wives faced as financial, political and social dependents of their husbands. She found that despite the sacrifices wives made as cooks, housekeepers and lovers, their reward was a life of drudgery, subject to the whims of their husbands. As the election of 1828 neared, Louisa overcame her own misery and rallied to support her husband's bid for reelection. She emerged from her seclusion to campaign actively for him. But this time, Louisa had to divert some of her energies to defending herself, as her foreign birth became a campaign issue. Born in England, she was viewed by some as un-American, which she vigorously denied, declaring publicly that she was "the daughter of an American Republican Merchant." However, her cordial hospitality made the last official reception a gracious occasion although her husband had lost his bid for re-election. The years immediately following Adams's defeat for reelection to the presidency were particularly difficult. Depression for both John Quincy and Louisa was compounded by the apparent suicide of their eldest son George in April 1829, in response to his father's mandate after the youth's sexual involvement with an employee at his boarding house. In 1834, the second Adams son, John, died of acute alcoholism. For Louisa, the double tragedy brought self-reproach because she had left the two boys at ages eight and six in Massachusetts with their grandparents. John Quincy had made the decision to leave the boys behind without consulting her, and she had yielded to his wishes and accompanied him in his diplomatic service abroad. In their shared grief, however, the parents drew closer together, and Louisa gave much attention to John's widow and their two daughters. On leaving the White House, Louisa had thought she and John Quincy were retiring permanently, but in 1831 her husband had begun 17 years of notable service in the House of Representatives. Louisa deplored his return to Washington as a congressman. However, as John Quincy waged his battle against the "gag" resolution, which denied the reading of petitions to Congress critical of slavery, Louisa helped summarize and arrange the numerous documents he received. The couple developed friendships with abolitionist leaders such as Angelina Grimke and her sister Sarah, and John Quincy became somewhat more appreciative of public activity by women. With the election of the Whig President William Henry Harrison in 1840, John Quincy enjoyed renewed acclaim, and Louisa resumed her lavish entertaining. As late as 1844, she gave parties for over two-hundred guests at events that lasted into the morning hours. The last years were for the Adamses the most satisfying in their relationship. In 1848, one year after their fiftieth wedding anniversary, John Quincy Adams collapsed on the floor of the House of Representatives. died on February 23, 1848. After Louisa Adams died at age 77 on May 15, 1852 in Washington, DC, both houses of Congress adjourned for the day of her funeral. She was the first woman to be so honored. She was buried in Quincy, Massachusetts, with her husband and her in-laws, John and Abigail Adams. Louisa Johnson Adams wrote two unpublished manuscripts about her own life in Europe and Washington: Record of My Life in 1825, and The Adventures of a Nobody in 1840. She was an accomplished musician whose talents included singing, playing the harp and piano, and composing music. She authored a play titled Suspicion, or Persecuted Innocence while she served as first lady, in which she stressed the strengths of women. John Quincy and Louisa's son Charles Francis Adams was a U.S. Congressman and an early, passionate advocate for the end of slavery. Their grandson Charles Francis Adams, Jr. was President of the Union Pacific Railroad in the late 19th Century, and another grandson Henry Adams became a prominent historian.